We had a great Friday at the beach. Joey, Mark and two friends came up from Brevard County and we did happy hour, that is funky hour, at the pier. Then to the ice cream shop for even more exotic tastes. Tom came up later in the evening and spent the night. That was a big help getting the car loaded again for the trip home. After breakfast on the pier, we returned home for about an hour then went to another friend’s birthday party down in Melbourne. So the day was long but fun. I didn’t go out to see exactly how the garden had fared until Sunday morning. I expected to find some casualties and found them but also some unexpectedly fast growth from other items. I lost a half dozen baby eggplants but will probably be able to make new starts before it gets just too hot. On the positive, the corn grew wildly and there are actually a few stalks with tassels and cobs forming. Several tomato plants actually have little green fruit; ditto a couple of the cucumber plants and the first row of bush beans – all sporting little tiny veggies. The tomatoes required serious staking considering the amount of growth they put on in just a week. The weed growth was also surprising and I spent a couple hours doing a row by row, down on my knees, purge and while down there, pulled the last of the onions, half dozen zucchinis, and a row of scallions. I also pulled out the row of snap peas which had pretty much gone the course as expected. The remaining four broccoli which were still producing a meal of florets every day, had totally gone to seed and, along with the peas, filled the compost pile to overflowing. Oh yeah, so did the last of the spinach and swiss chard. All of these were scheduled to go so no surprises. The kale plants look as nice now as they did last November – unbelievable. I was also semi surprised to find that the variety of chard I had planted based on it’s supposed ability to handle heat, was still coming along nicely. My experience has been that when the seed companies say something can handle heat, they are talking about Maine kind of heat, not Florida kind. The lake dropped even more. It’s now at the lowest I’ve ever seen it, exposing the area that I mined for lake bottom muck last year. I guess the good news is that I’ll be able to restart mining operations. Yuk. It would seem that the official rainy season is starting a month early but that is, so far, everywhere but at the lake so I might as well take advantage of the current situation and start loading up on muck. I remember just how much fun that wasn’t but I also think that the superior crop this winter was a direct result of all that soil reinforcement. It’s Tuesday and the wind is still blowing hard and in the wrong direction but at least the sun is shining. I’ll spend the day on the beach reading while Nancy plays bridge in Palm Coast. I have my eye on one of those Trader Joe’s Blueberry Ales for lunch – that counts as eating fruit for lunch doesn’t it? Since I’m heading the rules committee, it counts. We tried another new place for breakfast. Very good but no atmosphere and a bit on the female side in terms of the menu selections. Wed. The surf is full of big boomers but the wind has stopped and my 4 oz weights are holding in the surf. No fish yet but at least the fishing is technically doable. The good news is the return of sand fleas. With one scoop of the flea basket, I got enough big fleas to last a couple of seasons- even if the fish start biting. Update – the fish started biting and I bagged a couple pompano, whiting, and catfish. No blues yet but I’m happy just getting the pump primed on the catching. The water is still roiled and I would expect the fishing to improve as it clears. I parked alongside a jeep wrangler this morning at breakfast. What caught my eye was a tastefully painted on stencil that said “Mud, Sweat and Beers”. How perfect is that for a beach vehicle. We hit our favorite ice cream place in the world today. I’m not an ice cream person but this place taps something way down deep in me. Could be flavors like Irish Stout or Cappuccino kahlua that get me. Nancy’s favorite is Squirrel Bait. Thursday – fishing conditions much improved but not the catching conditions. I fished a good bit of the day and managed only a couple of small catfish. I lost lots of bait to what I guess are mini whiting bait stealers. Plenty of sunshine so how bad can it be. The beach trip has started out in typical fashion, so far. The weather is lousy – cold, windy, and wet. I’m getting used to that and know that by tomorrow, all will be well. We did a little exploring to see what’s new on the beach and found a couple of restaurants that were in process last year are now finished and open for business. By the end of the week we’ll have sampled them all. The pier restaurant is a totally new place and the menu looks great – breakfast, lunch, and dinner. The Fisherman’s Net now serves breakfast and it must be pretty good at a new place called Ocean View based on the number of cars in the lot. We decided to have a serious burger tonight so we hit the Sea Turtle Cafe where we ate the biggest, best tasting, most expensive burgers ever. It’s within 5 minutes of our digs and I wanted one more shot at the surf before calling it a night. And I did. What a monster, ferocious surf. I was using a 4oz pyramid sinker and it was tossed about in the surf like a bobber. The wind was blowing and it was lightly raining but I loved it. Not a fish but a big, big challenge. With the wind still blowing big time from the Northeast, looks like another day of little fishing so it will be an eating adventure and beach combing. We decided to try the pier restaurant, the Funky Pelican, for breakfast. It’s been totally remodeled and under new ownership. They did a fantastic job with the interior – the beach and pier are still the beach and the pier so the view is perfect. The food was as good as it gets, Nancy had the frittata of the day, and I did pancakes. Excellent. My new favorite breakfast place. Funky Hour, their equivalent of happy hour is 4-6, and we’ll hit that Wednesday with John Bachmann. Walking on the beach was an adventure. The wind is blowing steady at 25mph with gusts to 25.1. The surf was bring suds to the beach that were blowing faster than you could ever catch. Naturally that brings a strong current to the surf which makes it impossible to fish. It also makes it impossible to catch sand fleas for bait – that plus the water is cold. The big question I have with respect to the doings in Boston – Who is responsible for fixing the boat they flash bombed? That guy was totally innocent and ends up with a damaged boat. There was another dead bay tree that was fairly easy to get to but which I had judged just a bit too big for me to mess with, especially with my wimpy chain saw. The more I looked at it, the more marginal my decision to leave it alone became so I decided to go ahead and tackle it. I wouldn’t have but my neighbor, the tree cutter, is back in the hospital and I don’t want to load up his task list when he gets home – especially with heavy duty labor. Turns out I was right that my saw was too wimpy but had it cut 3/4 of the way through before that became painfully obvious. I brought out a hand saw but that was also virtually useless and was wearing me to a frazzle. I thought it was cut through enough that I could push it over by hand. Nope. Thought about tying a rope around it and pulling it over but I didn’t have a rope big enough to handle the job – not stout enough and not long enough. I decided to use an electrical extension cord which was strong enough and long enough but I could only get enough muscle into it to sway the tree, not break it off. So I tied the end of the extension cord to the truck and let that do the hard work. Down it came, exactly where I wanted it. It took an hour or so to limb it out and carry the brush to the fire pit. The pic’s show the downed tree and the fire pit. It was way bigger than the picture shows – it just looks like a small pile. Or maybe my mind was playing tricks on me. It was a bit windy so I decided to actually start the fire tomorrow morning before any wind comes up. My next trip to Lowes will include getting a 50’ piece of stout rope and a new chain for the saw. I’ve had the saw with the original chain for 10 years and I think it’s just worn out – beyond sharpening. I have my sights on another tree that could be doable with a new chain, a good rope, and the F150. My salsa garden actually doing fairly well this year. That means the lone tomatilla plant is looking good as are the jalapenos. Last year the tomatilla was a complete waste but I have to take most of the blame for that – chose a poor planting spot and then neglected it. This year it has a primo spot and TLC. I guess I should put in some cilantro to round it out. Other than that, a couple of the green pepper plants have blossoms and the eggplants are ready to move into the garden as soon as I yank the snap peas. Off to the beach. The next post should have pictures of huge catches. Or if you just see beach shots, that means I’m not catching anything worth a picture. Couple of garden surprises today: A few tomato blossoms already and on the potatoes too. The potato blossoms are purple – surprise, surprise. All the potato blossoms I’ve ever seen are white but then so are the potatoes I’ve planted. What I’m wondering is if the baby potatoes form underground the same as the tomatoes form on the vines so when we’re picking tomatoes, will we be picking potatoes? I’ll probably use that as a guideline to feel around under the plant for tubers. The corn is now 36” tall and I picked another double load of broccoli. What’s surprising about that is that we’re halfway through April and still picking broccoli. This particular variety, Packman, never seems to quit. We’ve been picking from these plants since December. We can’t pick the snap peas fast enough. I’ve started the next project which is putting up a row of high trellis to support pole beans, peas and cucumbers in the future. The start part is buying the wire mesh that will be supported on poles. I bought a 50’ roll of 4’ high wire. The wire is a 4” x 6” grid. I’ll pick up the poles later this week. The plan is to get 5 or 6 eight foot long, 4” round poles. They’ll be buried 2’ deep on either 6’ or 8’ centers – haven’t made up my mind yet but am leaning toward 6’ spacing. I’ll hang the wire on the poles starting about a foot above ground and down a foot from the top of the poles, about 30‘ lengthwise. My concern is that when there’s a full crop of pole beans, it’ll create a sail that’s 30’ x 6’ and we do get some strong winds. I have a mental image of a trellis loaded with beans sailing off into the sunset. Can’t happen. Critters taught me another lesson – they eat bone meal. I mix bone meal with regular fertilizer to give it a boost and left a bag out the other night along with a bag of fertilizer and a bag of Epson Salts – also a plant booster. They were all in a wheel barrow and rolled under palmetto trees for rain protection. I went out the other morning to plant a few new tomato plants and discovered that the bone marrow was history. Not a grain left just a torn plastic bag. I’m assuming it was a rat(s) but I guess it could have been a raccoon or possum; a squirrel? This has been fix-it month. The dishwasher has leaked for a couple of years, which didn’t really bother me but my bride saw it differently and since the stock market is up, she called a repair guy. Three trips and $150 later, it doesn’t leak anymore. The free solution was to put a small towel under the door edge. Then her antique feather weight sewing machine jammed. She was pretty sure that it was a thread lodged somehow in the bobbin and that I should be able to fix it. She was half right. I messed with it for an hour or so and decided it was not anything I was ready to deal with. There’s a guy over in Ocala that fixes them so off we went. What a great decision it was for me to give up early. Turns out Nancy was correct, it was an errant thread in the bobbin mechanism but getting that piece out of the machine was no mean feat. The part is a highly machined precision part that is easily broken if not handled properly and that part is $250. For perspective, the whole machine is $350. For just over $50 he repaired it and sold her a bag of needles and a special vacuum cleaner attachment especially for cleaning sewing machines and other delicate equipment. Fixing these machines and refurbing old machines to sell is all this guy does and I could tell he had a nice business going. Some of the machines are painted special with 7 coats of high gloss lacquer and wild colors. The guy who does his painting does custom cars so it shouldn’t have been a surprise to find a candy apple red with a flame design. Some were like pieces of art. My favorite was when he looked straight in the eyes and said “young lady, this machine is not very clean”. A stab in the heart for sure. If I had said that, I’d have been eating the machine. That was worth the $50. We had St Patrick’s day dinner redux – corn beef and cabbage and carrots. It was really good last time and the cabbage and carrots in the garden are about over for the season so it just made sense. I’ve been thinning the palmetto’s in one area to improve the lake view from in the house and, in the process, fairly well wore out or seriously dulled, the chain saw. I had it sharpened and decided to attack a few of the dead bay trees that were what I consider, manageable size. I got down four of them before both the saw and me gave out. I think I can fix the saw and I probably need a day’s rest to recover. It’s not just cutting down the trees, it’s gaining access to the dead ones through really dense brush and then dealing with the carcasses. Good thing I’ve got a left over kale salad waiting for me at lunch. According to everything I’ve been hearing lately on the subject of nutrition, kale is the super king. And I thought it’s only purpose was to put along side real food to make it look good. Four more dead bay trees today, eight total. I still have another four that are too big for me to handle but the ones I did get make a big difference. I burned all of them – well burned those that I could get out of the jungle. Some fell in places that were totally inaccessible so nature will have to do the job. When the bays first started dying off, a beetle transferred fungus, I was concerned that we’d end up with no bays anywhere. What’s happening is that lots of new bays are coming up quickly and seem quite healthy so maybe this is a normal cycle. 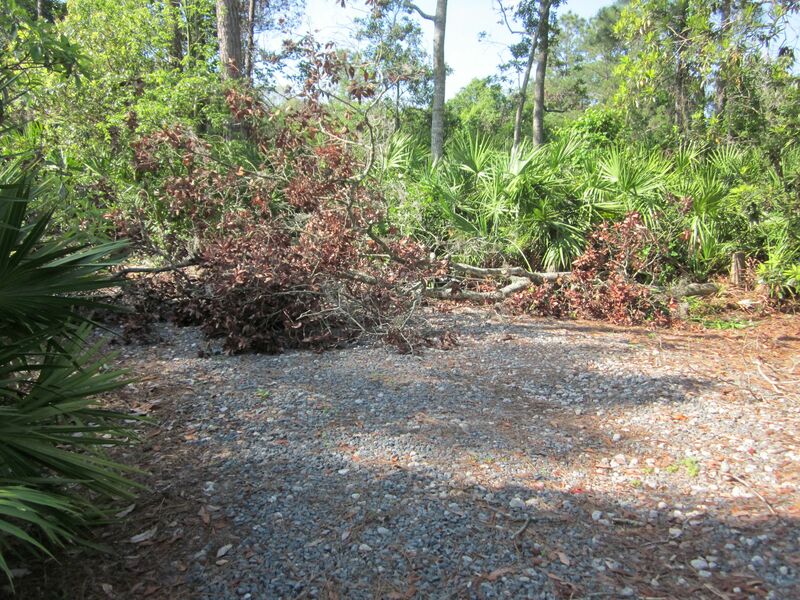 Back to cutting/thinning palmettos and guess what – I found two more dead bays and a dead water oak. You probably wonder how I keep coming up with new “dead” trees. Well, the jungle is fairly dense and it’s only after thinning and clearing that these show up. These new ones will fall in the jungle and require no extraordinary effort to deal with the carcasses. We have company coming for lunch next week and I wanted the path to the dock cleared more than usual since these guests are not what you’d call jungle friendly. That’s when I found the new chain saw ready trees. I was able to distribute lots of veggies to the Easter party crowd and gave the standard garden tour. You can always tell the folks who have tried gardening unsuccessfully because the first thing they jump on when they see mine is how I control weeds. They see it’s virtually weed free and ask what I do to keep it that way. They already know I don’t use weed killer so they suspect I either use some natural potion or plant special plants that ward off weeds. I explain that how I deal with weeds is to position myself directly over a weed, grasp it firmly right at ground level and then yank it out of the soil. It works 100% of the time and has the added advantages of being cheap, adding mass to the compost pile and providing me with exercise. I get some really strange looks when I detail the technique. Nancy is floating around about a foot off the ground. Charles and Grace called the other night from Disney to tell her about the reception Grace was getting there wearing the Snow White costume Nancy had made for Halloween two years ago. She told Aunt Nancy that she was really, really Snow White and Charles said he could be selling them easily with people just walking up to them asking where they got the dress. Nancy and Grace have Sleeping Beauty in their sights for 2014. You know you’ve moved over to the dark side when you are even considering a recipe for Kale-Lentil salad but that’s where it is. Even two years ago, I would have run for the hills at even the mention of something like that, let alone actually looking over the recipe to see how to spice it up. I hit another of those weird beets. A few posts back I mentioned picking a pure white, albino beet. This one is pink, halfway between the traditional blood red and the rare white one; closer to white than red. The ribs and veins on the leaves were white so it’s closer to the albino than the classic. This time we kept it, giving our friend the leaves only, so we’ll be able to answer the taste question. Will it taste white, pink or red?